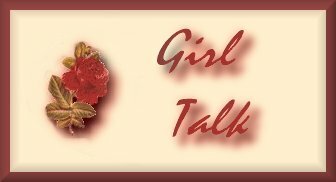 Welcome to Girl Talk. Something a bit new to my pages that I've conjured up. I thought this would be a nice place to just come and jump from link to link as well as 'adding' links along the way. I'm sure you've ran across a great site for just girls. This site will cater to the TEENS of today. This site will be 'G' rated. If your 13-19 then you should find this a bit interesting. And yes; even us older girls might just find something that we like as well. I really guess I should be saying 'young ladies' because that is what they are or are becoming. First let me say I have a daughter that is 16. She is the inspiration behind this as well as GOD because she wanted to have a site that she could come to and just look at the different categories and jump to without having to search and hunt for the one she wanted. I've arranged (well tried) to arrange categories for you. Enjoy girls and have fun. Oh; please sign the guestbook please. I'd like to see who finds what interesting or if you would like to add a link; please feel free to email me and I'll sort it into a catagory or make one up for it. Oh and yes she is driving now so she had to put some links for those "just gotta have" cars of 2000. Skin Problems; Help is Here.